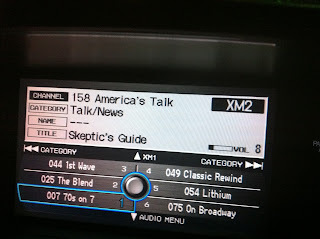 The Skeptics' Guide to the Universe this week did not feature a guest interview or guest rogue, but it will be the first episode to be not only uploaded to the net for distribution, but also broadcast about the lower forty-eight states and Canada on XM Satellite radio on Channel 158 "America's talk." The version on XM is only going to run about sixty minutes rather than the typical 120 minutes on the podcast, so I will be interested to learn how the episode is edited. I have had XM for six or seven years, and have grown to love it. Channel 158 is a random talk channel that I rarely ever listened to, except Tech Guy's Leo Leporte from time to time. The SGU is an interesting counter point to the Alex Jones and Rollye James show, who have been known to have some interesting ideas. The topics covered were the recent "revelation" that the signs of the zodiac have shifted over the past two thousand years, and for most people their sign is not what they thought, and the passing of exercise guru and juice machine pitchman Jack Lalanne who recently died at aged 96. The recent terrible science scoring of American students was discussed and lamented. Yes, a cold fusion story out of Europe was in the mix too. A email covering an alleged alien abduction with possible biological evidence was analysed by the Rogues. It was a solid episode. I have a feeling the topics that were picked were done in part to introduce the SGU to the satellite listening masses of truck drivers, tech geeks (like me), as well as those in rural areas without much terrestrial radio choice. They covered a popular topic in the news, astrology and the zodiac; alien abductions which is always in the popular consciousness, beloved public figure Jack Lalanne, as well as education, another area of popular interest. I am not saying these were not worthy topics, but I suspect a wide net approach was used. The other odd thing for long time listeners of the show was that Steve would stop the show and explain that he was a neurologist, and how they came up with the name "Who's that Noisy." I suspect they will continue this practice for a few episodes until they build up a satellite audience. I hope the show takes on XM, since who knows maybe the Skeptic Zone or the Conspiracy Skeptic will get a crack being broadcast from space if skepticism find fertile home on XM. It is sort of depressing that the SGU shares a station with some rather dubious sorts at this time, but leave no doubt I think it is HUGE that the Guide has springboarded into space. Also changed was the end tag to the show announcing that the Skeptics' Guide is a production of SGU productions. Interesting. Don't worry "Theorem" by Kineto is still the show's theme music. On the Skeptic Zone the episode opened with a new techno version of their theme music, which I quite enjoyed and hope they keep. It is much more tight and button down than the fanfare style of their normal intro. This week's episode featured a well done interview by Maynard of Jessica Adams - astrologer and psychic medium. The interview focused almost exclusively on astrology. It is rare for the Zone to pull a trick from Righteous Indigation and interview a believer. While I do not think such should be a regular event from their normal interviews of working scientists, skeptical activities, consumer watchdogs, etc, it is a nice change of pace. To a seasoned skeptic, or even someone less impressive like me, Adams' interview came across like skeptical student fact pattern where the pupil after listening to the interview is challenged to list out the logical fallacies. Adams, for all intents and purposes, came across as completely genuine and she sure seems to believe everything she said. I will leave it to the listener to listen and keep their own mental track of appeals to popularity, special pleading on top of special pleading, explanations with quantum physics, and more. Adams sounds to be a perfectly nice woman, and would likely make a good neighbor, but boy oh boy is her world view 180 degrees different from mine. Maynard did a quite professional job moving the conversation forward without being pandering or abrasive. Although his use of kitch sound effects was a bit too morning drive time radio for me. Saunders after the interview instead of doing the improper thing and analyzing and basically ripping apart Adams instead invited the listener to post on the episode's comment section. Although you can just hear Saunders was likely just dying to dive in and dissect the interview. The show also featured a segment where Saunders was taken to a secret Melbourne location where the one time world's largest telescope, in the 1860s, was being refurbished at great effort and time by volunteers who wish to preserve a bit of scientific history. I would have loved to have seen it myself, and all the ingenuity that Victorian era engineers could muster. The show also had a brief radio interview of Richard Saunders on the inaccuracy of predictions made by psychics, and in particular why none of them predict recent devastating floods in Queensland, Australia. This was followed by "The Think Tank" featuring Saunders, Dr. Dunlop, Maynard, Travis Roy, and Jim Crawley. The Think Tank is always a welcome bookend to an episode. The only thing that was off was that Roy was participating via Skype. It was not Roy's fault, but the rhythm of the panel was off since one of the participants was not present in the same room as the rest of the gang. Don't get me wrong, if I were invited to appear via Skype I would do it in a New York minute, and then others could write how I was tossing the proceedings off just a wee bit. I enjoyed this episode, especially for the interview with Adams, and the refurbishing of the telescope was also a compelling segment. Maynard announced that he would be interviewing the hosts of Mysterious Universe, Benjamin Grundy and Aaron Wright. I used to listen to MU all the time when it was just Grundy, and I have enjoyed its woo-stuffed episode from time to time with the new show which features Grundy and now Wright. I hope to not be disappointed. Lady and I are away from SR Headquarters this week. No, we will not be headed to Manchester, England to partake in Q.E.D. We are headed to hopefully the warmer climate of Florida for a few days of Harry Potter butterbeer for lady, and the Haunted Mansion for me. I might post a small thing or two while I am away.